Does your purse needs an inner purse? Something small to organize all the little loose things that migrate to the bottom of your purse. Something to make it easy to move your stuff from purse to purse. Does your stuff need a keeper. Suzi is ideal for keeping things together in a busy purse, or easily moving your things from purse to purse. 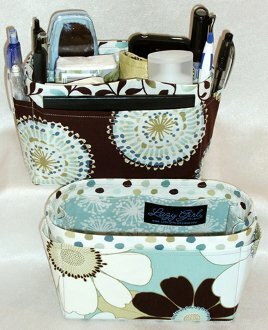 Suzi also makes a great organizer or caddy and is wonderful to use for sewing or desk supplies. Medium is 6.5" x 4.5" x 3"
Large is 8.5" x 4.5" x 3"